You need three things for a death pool: 1) celebrities, 2) news media, and 3) people who differ in their opinions. Even if we insist that celebrities and media require civilization and cities, it is still easy to imagine that such pools – in which people attempt to predict, and perhaps even profit by, the deaths of well-known personalities – existed in Babylon, Athens, and Rome. “In Genoa as elsewhere, policyholding on the lives of public figures in the context of commercial risk gave rise very quickly to purely speculative investments. The men who lent Pope Nicholas money presumably had a legitimate financial interest in his life. But other life insurance policies were taken out on the lives of popes by people who had no such financial stake and who were thus merely wagering on how long the reigning pope would live. The Venetian Senate reacted against these scandalous gambles as early as 1419 when it forbade wagers on the pope’s life… and nullified the many bets that had already been made on the life of [Pope] Martin V.
This, however, did not put an end to it. In 1591, such wagering had reached epidemic proportions in the Curia Romana, the administrative branch of the Church. 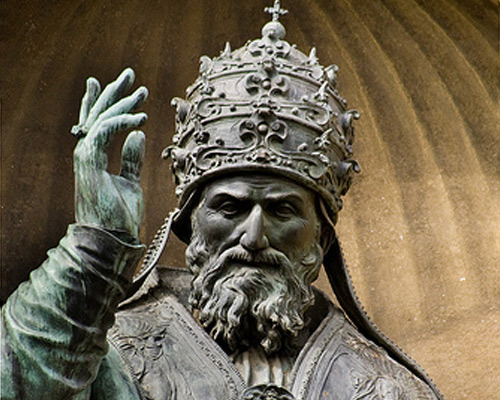 On March 21, the newly minted Pope Gregory XIV forbade all wagering on the duration of the pontificate, i.e., when the Pope would die, and on the papal elections that followed. His concern was well-placed; he died in October, after just 10 months under the papal tiara. Duroy is referring to the French Academy, formally chartered in 1635 by Cardinal Richelieu, with its number fixed at 40 members representing France’s wisest and most learned. A new member could be added to the Academy only when an existing member died, hence any death in the ranks was doubly noted by the public — firstly as the passing of someone famous and secondly as an opportunity for a new worthy to ascend into the company. It’s a small step for observers to speculate who among the 40 might be the next to die, and who might replace him, and to differ in their choices. “Death and the Forty Old Men” may well have been played for many years before de Maupassant wrote about it in 1885. “An item here about the tavern that had a pool one Labor Day weekend on the number of highway deaths in the state brought to mind a similar sort of gambling pool that existed at one of the big New York City papers back in the Thirties. It seems to me that I’ve mentioned this one before, but everybody I’ve described it to in the past few weeks has acted as if they’d never heard it, so maybe I didn’t. “The genius who devised this macabre lottery is unknown, at least to me, but he did have an original idea. He chose 100 persons of some prominence, people important enough to merit newspaper obituaries at death, and he wrote their names on individual slips of paper, folded them and put them in a hat. Then he went through the plant — the city room, sports department, composing room, business office, and so on — and for a dollar’s initial contribution, each participant picked a name out of the hat. You kept the name you’d obtained for an indefinite period, but each week you paid in another dollar. The pot thus grew bigger each week, and the players in the game kept studying the obituary columns, because the winner would be the person holding the slip on which was written the name of the first one of the 100 prominent persons to die. Post and Rogers crashed on August 15, 1935. If the amount of cash is correct, the pool probably originated in 1934. The crash near Point Barrow, Alaska, shook the nation. Post was a very famous aviator — the first man to fly solo around the world — and Rogers was a beloved humorist, famous on stage, radio, film and the pages of the daily newspaper. Every few years, journalists discover a death pool and write it up as if it’s news. But they are many centuries late in noticing the pursuit.